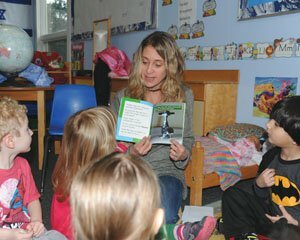 Coinciding with May's Water Conservation Awareness Month, Port Washington Water District launches new Water Conservation Education youth program featuring kid-friendly educational activity books. Port Washington, NY – May 21st, 2013 – Teaching, preparing and educating our children about the importance of conservation will have a profound affect to the future and sustainability of our natural resources. As a leading authority on water and conservation, Port Washington Water District (PWWD) understands the significance of educating our future leaders at an early age and providing engaging experiences is critical to their development. Supporting this initiative while also observing Water Conservation Awareness Month, the PWWD Board of Water Commissioners recently announced the development and launch of interactive and fun educational activity books for children that emphasize the importance of our water system and environment. PWWD will deliver these books in the backpacks of all Port Washington public and private school kindergarten and elementary school students. Creating awareness of water as the building block of life. Understanding of the water cycle and Long Island’s Aquifer system. Ideas of conservation, sustainability, the environment, and similar topics. The activity lessons are illustrated in entertaining images that promote both education and creativity, offering fun for all kids as they color while learning important facts about water, conservation, the environment, and safety. PWWD produced the custom-designed educational activity books with Deborah and Joe Linder of Colorfully Yours, Inc., which has created similar books for Public Service Departments around the country for 50 years. Subject: LongIsland.com - Your Name sent you Article details of "Port Washington Water District Launches New Water Conservation Education Youth Program"